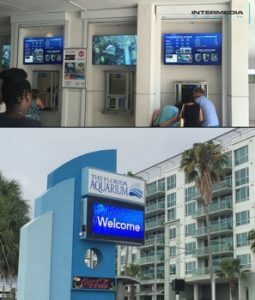 The Florida Aquarium Contracts Intermedia Touch to deploy a sleek and modern digital signage solution to greet and engage their guests. Intermedia Touch started by installing two 5 x 10-foot Daktronics LED displays at the entrance of the aquarium property, as well as four 50-inch high-resolution monitors, powered by 22 miles platform, in the ticket booth of the Florida Aquarium. Intermedia Touch installed two top of the line 5×10 foot LED displays at the entrance of the aquarium to welcome guests and informs them of the aquarium’s hours of operation. The displays are Daktronics’ Galaxy Outdoor GS6 series and are one of the best outdoor display LEDs on the market today. The GS6 cuts through the visual spectrum with high impact clarity and definition. “Our GS6 Model line is engineered for success. The louvers are specially designed by Daktronics to provide the best color depth and contrast of any displays on the market, without blinding the driver. The modules on the display are also fully sealed to provide enhanced reliability for the end user which means less service issues. The control software is also state of the art, utilizing Daktronics’ true cloud-based solution where the Aquarium will be able to control their new GS6 from anywhere in the world.” – Jeff Good, an Account Executive from Daktronics. The 50-inch displays that were installed in the ticket booth provide a sleek and elegant look while efficiently displaying information for the ticket booth that is relevant to their audiences like special events, promotional discounts, and special announcements. Also, the 22 miles platform allows the Florida Aquarium to create, upload, and manage this content remotely to allow the Florida Aquarium to update their digital signage efficiently and with ease with this cloud base solution. Intermedia Touch, Inc. is a leader in interactive technology and custom application solutions for a broad range of corporate clients. 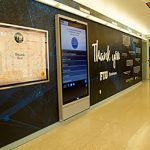 Offering unmatched service and extensive experience as a technology integrator, our goal is to create unique experiences by making use of the latest interactive technology and applications available in the digital signage industry. Intermedia Touch, Inc. offers powerful custom software solutions as well as a diverse array of interactive hardware options that include interactive touch screen monitors, interactive infrared surfaces, interactive video walls, interactive holographic glass, indoor/outdoor kiosks, as well as LED signs. With more than 15 years of experience in the information technology and audiovisual fields, the team at Intermedia Touch, Inc. strives to tailor custom interactive solutions that will create the highest visual impact and relevance for your specific target audience. For further details on the products and services that Intermedia Touch, Inc. has to offer, feel free to contact us at 305-517-3894, or send an email to info@intermediatouch.com. You can visit us online at www.intermediatouch.com or in person at 2600 NW 75 Avenue, Suite 200, Miami, FL 33122.